Apple has updated its iPad range, adding an extra special something for designers. It's hard not to love the Apple Pencil. It's one of the best styluses we've ever used, and it provides an impressively natural drawing experience. 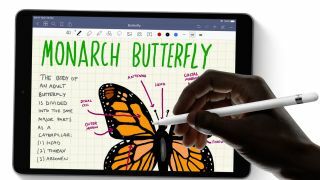 The only problem with it is that until recently you needed an iPad Pro to use it; Apple launched a 9.7-inch iPad with Pencil support last year, but the rest of the range remained Pencil-less. That is, until today. Apple has just announced a bunch of new iPads, and they all support the Pencil. Now, whatever size iPad you prefer, you're able to sketch and draw to your heart's content with one of our favourite styluses. Top of the range is the new iPad Air. We're big fans of this lightweight, super-slim model with its ultra-thin bezel, and the latest version has us rather excited. As well as Apple Pencil support, it also works with Apple's Smart Keyboard, and it now boasts a 10.5-inch Retina display, making it an excellent budget alternative to the iPad Pro (coincidentally, Apple has now discontinued the 10.5-inch Pro). The new iPad Air runs off the same A12 Bionic chip found in the iPhone XS, making it perfect for all the best drawing apps for iPad. It also features Touch ID and a choice of 64GB or 256GB storage. Like the rest of the iPad range it comes in both Wi-Fi and cellular flavours, with prices starting at $499/£479 for the 64GB Wi-Fi model and going up to $629/£749 for the 256GB cellular option. Hold on, though, because there's another option that's almost as thrilling. After being a little neglected for the past few years, the iPad Mini has had an update, and it could be just the thing if you want a digital sketchpad that fits in your pocket. On top of its Pencil support, the new Mini has a 7.9-inch Retina display and also uses the A12 Bionic chip, making it a punchy little contender. Again it comes with Touch ID and a choice of 64GB or 256GB storage, and it's available now at a great price: the basic 64GB model with wifi will cost you just $399/£399, while the top-end 256GB cellular model will set you back $679/£669. Finally, there's an updated 9.7-inch iPad, but it doesn't have us quite as enthralled as the other two. It only packs an A10 Fusion chip – no slouch, but it's not the A12 – and up to 128GB storage, but on the plus side its 32GB Wi-Fi model is great value; you can get it today for $329/£319, while the 128GB cellular version will cost you $559/£539. If you want a 'budget' iPad then this is definitely the way to go. One thing to bear in mind with these new iPads is that they only support the 1st generation Apple Pencil (read our Apple Pencil review here); if you want the swanky new features of the 2nd gen model such as wireless charging, we're afraid you're still locked into the iPad Pro. All the new iPads are available to order today, and if you have an old one knocking about that you're not going to need any more, Apple now offers trade-ins, enabling you to knock a chunk off the asking price of that sweet new iPad Air. Now if you'll excuse us, we have to go and check our bank balances. Sign up below to get the latest from Creative Bloq, plus exclusive special offers, direct to your inbox! Is this free US government font the new Helvetica? Creative Bloq is part of Future plc, an international media group and leading digital publisher. Visit our corporate site.